'Familia Naranjo' has been on the move for the last two years. From the Maryhill Art Museum in Washington, to Dexter, Oregon and then for the last five mounths at the Big Rock Sculpture Garden in Bellingham, Washington. Wow this family has been on a serious vacation. Now it's back home waiting for a future exhibition site or a permanent home. Posted on September 30, 2011 by Kim Campbell and filed under Installation. I just finished a temporary installation of my relief entitled, Entidades. It's out in front of our studio in Sellwood on the Tacoma Street side. I hope the rotating art show entertains the drivers stuck in traffic. I welcome inquiries from folks interested in encorporating into their living or work environment. Posted on August 1, 2011 by Kim Campbell and filed under Installation. We loaded all five family members on a trailor and headed up the Columbia Gorge to install 'Familia' at the Maryhill Art Museum in Maryhill, WA. My wife Kim Campbell and son Tamaio even tagged along for a lovely drive. After dodging peacocks and other outdoor sculpture we were able to get the trailer into place in a sweet spot next to the installation site. In order to withstand gale winds in the Gorge we used about 30 bags of concrete to anchor each piece down. Without the help of Lee Musgrave, the able-bodied grounds crew and my good friend Lee Imonen I'd have met my match on this installation for sure. 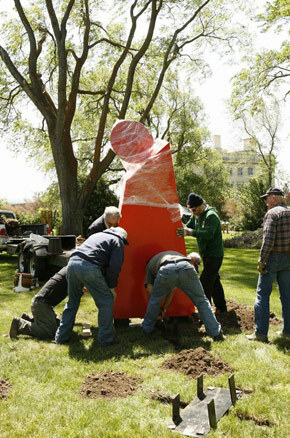 The Outdoor Sculptural Invitational is in a few weeks and I can't wait to see all the other work that assembles there. Posted on May 1, 2009 by Kim Campbell and filed under Installation. 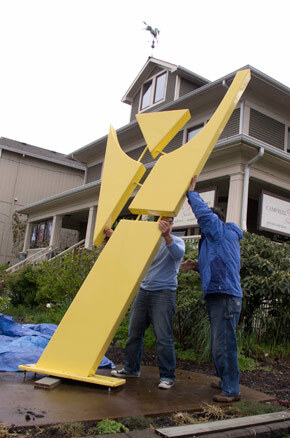 The installation of Jump in Lake Oswego on June 2008 was an unusually simple. 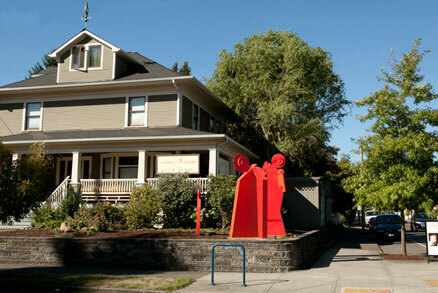 The city of Lake Oswego contracted a company to do all the installations for the artists to make sure the pads and supporting spaces are engineered to proper codes. As a sculptor unaccustomed to such gracious installation support I have to say it was by far the easiest installation I've experienced. Posted on June 14, 2008 by Kim Campbell and filed under Installation.